Introducing our amazing Bone inlay furniture stencils! These furniture stencils are expertly designed to help you to create the look of popular inlay furniture for much less! Real camel bone inlay dressers and tables are meticulously handcrafted and can be very expensive, and with our inlay stencils you can turn any plain piece into a DIY inlay treasure! Imagine stenciling a garage sale find into a gorgeous, trendy and stylish inlay masterpiece! Our geometric Maya Inlay Stencil Kit includes 6 inlay stencils. 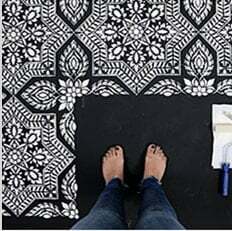 These stencil designs are intricate and beautiful, but at the same time, very durable, reusable and easy to work with.